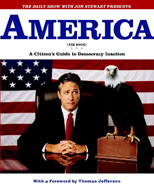 As part of my on-going effort to "read" more audio books, I thought I'd try a book a little outside of my comfort zone -- AMERICA: A CITIZEN'S GUIDE TO DEMOCRACY INACTION presented by The Daily Show with Jon Stewart. I decided to take a little break from the Dexter series (which I've grown quite fond of) because it was getting a little creepy running in the dark while listening to Dexter dismember people. Enter AMERICA! I think Jon Stewart and the entire cast of The Daily Show are a riot and I've been wanting to listen to this book ever since I saw Jon Stewart at this year's BEA. Let me tell you...I loved this book! In fact, I'm glad it was dark out while I was running and listening to it because my neighbors would all think I was crazy. I laughed and laughed at this book and truly appreciated this irreverent look at our country's history and political structure. So much of what was presented was spot on, and because of that, hilariously funny! Even though I get frustrated with politics much of the time (and sometimes feel like crying), I had to laugh when Jon Stewart gave me his take on the events. In fact, I can't rave enough about how smart and witty this book was. Even the way AMERICA was presented was funny. The book was set up in the format of a textbook. There were chapters covering our history, the branches of government, recent elections, etc. There were even chapter summaries which outlined what we could expect to learn as well as discussion questions and classroom activities at the end of each chapter. I found the discussion questions to be hysterical and one or two even made some surprisingly good points. As is often the case with books like this one, there were definitely sections that appealed to me more than others. I think the first few chapters of this book that dealt with our country's history and the creation of our government were my favorites. I couldn't stop laughing at how our forefathers were portrayed. The end of the book which covered the Bush elections didn't resonate with me quite as much. I think because AMERICA was released over five years ago, these sections seemed a little outdated. Of course, it took me so long to "read" the book that it was my own darn fault! I definitely learned my lesson and won't be waiting that long to listen to EARTH. I received an audio download of this book at the 2010 BEA from the publisher. I laughed out loud at parts of this one too - it's just hysterical! You do need to take a peek at the printed copy the next time you're in a bookstore so you can get a gander of the picture of the Supreme Court. OMG that forward from Thomas Jefferson about made me run off the road! It was just what I needed to, because I'd just gotten into yet another fight with Walgreens. Swapna said that Earth wasn't nearly as good, but I'm still inclined to give it a try. First a full disclosure: I have a major crush on Ed Helms. He's so stinkin' funny how could I not? Seeing your review makes me excited to read Earth (The Book): A Visitor's Guide to the Human Race. I listened to Earth, after which I definitely want to get to this one too! I agree with Sandy - the Thomas Jefferson forward was incredible! The founding fathers parts were my favorite, great review! I have the print version and while I've not read the whole thing straight through I love to pick it up occasionally and reada chapter here and there. Always puts a smile on my face. Oh gosh, I'm the only who hasn't listened to this yet!